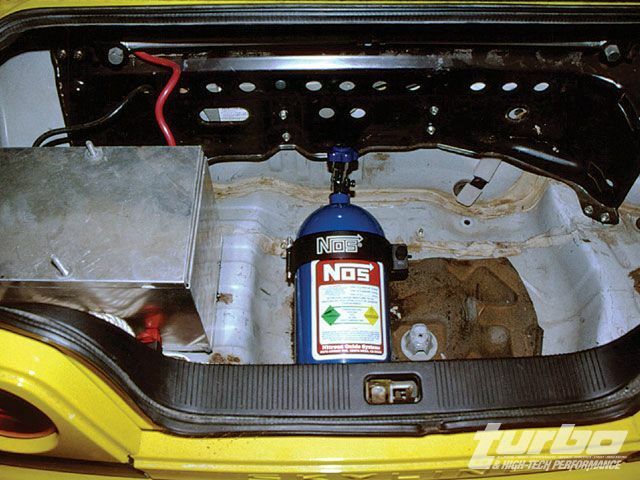 Anyone who has seen ‘The Fast And The Furious’ knows about nitrous oxide – right? It makes your car spit green flames and everything turns blurry as you accelerate when you hit the little red button marked ‘NOS’ on your steering wheel – right? Well Hollywood would like us all to believe what we see on the big screen, but what use is nos to those of us not built like Vin Diesel? First of all – how does it work? Well, if you listened in Chemistry lessons you would know that air is roughly 21% Oxygen, which is the useful part as far as an engine is concerned. Nitrous Oxide (N2O) is 33% Oxygen. So for any given volume of gas, you have more Oxygen available with which to burn fuel. And that’s how you get more power. Kits from different manufacturers vary, but there are two main types of kit – ‘single fogger’ and ‘direct port’, and then within these categories you have ‘wet’ or ‘dry’ kits. A dry kit only injects nitrous oxide, meaning the extra fuel has to come from the car’s standard injectors, while a wet kit also injects fuel along with nitrous. The main advantage of a wet kit is that you can install and run it without interfering with your car’s ECU. This is obviously cheaper and more convenient, and for this reason ‘wet’ kits are a far more popular choice. The air/fuel ratio is adjusted using different sized restrictors, or ‘jets’, placed in the flow of nitrous/fuel. Obviously the best way to check your fuelling is with a wideband O2 sensor, but most manufacturers will supply kits with jets that are known to be on the safe side. A single fogger kit uses one extra injector (or ‘fogger’) to inject nitrous and fuel into the intake. A direct port kit has one of these injectors per cylinder, located near the standard injectors. 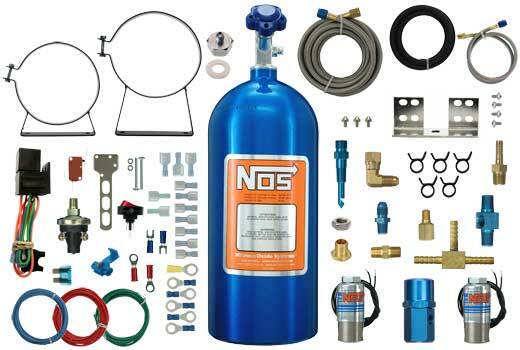 Direct port kits are used where the distribution of nitrous between cylinders would be uneven using a single. There is quite a lot of technical debate about whether or not a direct port system is more suitable for a Skyline application, I am staying well out of that debate for the purposes of this article! I will concentrate on a single fogger kit, as that is the kit that I have experience of. You get two solenoids, one for nitrous, one for fuel, and they feed a single injector (or ‘fogger’) located just before the throttle. Your fuel is tapped off from the existing source (usually by inserting a T-piece in the fuel supply line), and liquid nitrous oxide is stored in a pressurised bottle, which most people mount in the boot. And of course you get the ‘end of the world’ switch, to arm the system. Installation is straightforward, with only a few minor technical points to take into account. The bottle must be mounted correctly, according to the kit instructions, or you may get gaseous nitrous instead of liquid, which will be no use. I managed to install a kit myself over a weekend – and if I can do it without major incident I’m sure anyone can! And so to the road. Heart pumping, fingers and everything else crossed, I flick up the red cover and turn the switch to ‘ON’, keep the speed steady round the roundabout then onto the dual carriageway. Holding revs in 2nd gear, I take one last look at my brave (or putting a brave face on, at least) passenger and squeeze the throttle open. At first, there is nothing – a slight delay while the nos finds its way down the lines and into the engine – and then a burst of torque. Already snatched 3rd gear, then 4th gear before I know it, hit the brakes for the next roundabout, all the way round and back down the way I just came, again on wide open throttle, again gearchanges coming at me sooner than I expect, but this time I’m not concentrating and watching gauges – I’m laughing manically and grinning like a loon! There was no motion-blur, there were no green flames from the exhaust, but there was a noticeable increase in torque. The next stage, after a fixed hit system becomes too much for the wheels to handle, is the option of a ‘progressive controller’, which pulses the solenoids to feed the extra power in gradually. This also serves to decrease the ‘shock’ load on engine components, making it more engine-friendly. Bigger diameter lines can be used to flow more power, but the disadvantage of this is the need to ‘purge’ the lines before using the system. As liquid nitrous is forced down the lines (under pressure), the very first drop at the front of the lines will expand into a gas. This effect is drastically increased using bigger lines, so a separate valve is used to vent the first second or so of gas out to atmosphere, leaving the lines full of pure cold liquid nitrous goodness. You could get several hundred extra hp from a nitrous kit working flat out. If you want more than that, pro dragster classes where nitrous is allowed could (and do) run something like 8 sets of solenoids on a V8 (16 solenoids in total) to provide huge horsepower increases, running quarter miles in the 6 second bracket. And that is some serious speed! Nitrous is fun. The above pic, of the bottle in the trunk of an R33, is the one I did in Big Bird. On that car we ran a direct port setup. Purging nitrous is important, as you want to have liquid nitrous in the lines.